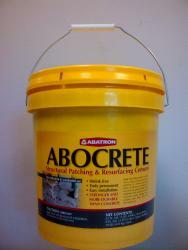 Abocrete epoxy patching and resurfacing compound has many uses including; rebuilding broken concrete floors, steps, columns and precasts. Excellent for decks, driveways, bonding broken concrete pieces, filling cracks, anchoring bolts and more. It is shrink free, truly permanent and stronger and more durable than concrete. This kit contains: 1 quart of liquid epoxy resin, 8 ounces of liquid epoxy hardener and 10 pounds of sand.